New Delhi: Kingfisher Airlines Ltd, the country’s second biggest airline by passengers flown, has paid the Airports Authority of India (AAI) Rs50 crore towards dues owed after the aviation ministry made it clear to the airline’s chairman Vijay Mallya that he risked having the firm’s bank guarantees encashed, said a senior government official familiar with the matter. “Everything is under control. I have met all their payment obligations," said Mallya, referring to the Rs280 crore owed to AAI and money due to oil firms on aviation turbine fuel (ATF) purchases. The ATF dues amounted to some Rs983 crore at the beginning of November and have come down by at least Rs11 crore after Kingfisher paid Indian Oil Corp. Ltd the amount. The payments, if any, made to other oil firms are not known. The Kingfisher chairman said this after he met aviation secretary M. Madhavan Nambiar on Tuesday and before heading for a meeting with AAI chairman K. Ramalingam for the second time in two days to discuss pending dues for usage of airports, which now stand reduced to Rs230 crore. AAI had earlier set a deadline of 1 November by when Kingfisher had to pay its dues. The government official, who declined to be named, said the Rs230 crore payment is being sought by the end of Tuesday, but Mint could not ascertain if this payment had been made. 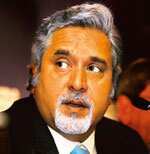 The Jet Airways-Kingfisher Airlines alliance was struck last month. Everybody wants to know what’s happening with the alliance? $400 million, on the contrary, is the amount of equity investment we have been discussing. There is some storm over your statement that foreign airlines should be allowed to invest in Indian carriers. Have you actually petitioned the government? If you see me with somebody and you phone me and say that what were you discussing with him, am I to say no? I don’t tell lies. That (the possibility of such investment), we will find out from the government. See, there is a limit to how much we can take off our clothes. People who have invested substantial stake in my company don’t need to read about my company in the media, they need to be told by me. But the media keeps writing all what it feels like. All I am doing is I spent six hours in a day today sending out hard facts on email to all my investors (that) said what rubbish we are reading in the media...whereas all the facts are wrong. After the reduction in price of jet fuel, can we expect to see a fall in ticket prices? Please understand, look at the things honestly. ATF (prices) came down, but still it has a hugely punitive tax structure. And costs have gone up dramatically on the other side, on depreciation of the rupee because every aircraft is leased in dollars, all maintenance contracts are denominated in dollars. So, let’s not look at just one element of fall in oil fuel prices and say fares must come down. The finance minister (FM) has said there is a need for the aviation sector, among other industries, to reduce prices to stimulate growth. Your comments. I did not hear the FM. If the government is willing to do its bit and reduce the tax on fuel, absolutely, the airlines will respond. Is your $200 million investment in Epic Aircraft (a very light jet aircraft maker) announced last September off? Abhi woh chalu hein, yaar (it is going on, my friend). Nothing is off.